After a considerable length of silence, Lo Zu stood up and said, “If you want the truth, follow me and do exactly what I say, but it will be a very arduous journey with many difficulties.” Then Lo Zu took his meandering cane and began walking, and all of the youth eagerly followed him, with excitement and expectation in their eyes. village, many of them were aching with pain from the tiresome journey and from the heavy weight of the stones (over time). When they finally reached the village, Lo Zu told them to place the stones in a large pile. It was the end of the day, getting dark, and everyone was extremely exhausted (except for Lo Zu who did not carry any stones). Lo Zu asked them, then, to stand in a circle around the stones. Then Lo Zu remarked to them all, “Here is the truth you worked so diligently for. These stones are absolutely worthless. They are not any different from any other stones that one can find. You believed in me, hoping for the truth to be handed to you. Out of your confusion, you decided that I always held the truth (to give to you). Many people, out of confusion, choose high-ranking “others” to lead them to the truth; out of their confusion, they choose! They go to temples and ask the temple-keepers to give them the truth. What the temple-keepers generally give, however, is as useless as these rocks. Nevertheless, people blindly and devotedly adhere to what they say, just as you have done with me today. It is evening, and you may be disappointed to find that you have wasted your whole day. Do not feel too wronged by this. Many people have wasted their entire lives in carrying the worthless stones, burden, weighty images, and so-called sacred statues of others, and it isn’t evening at the end of it for them; it is the time of their death. They wasted not a day but their entire life, and the sacred eluded them. find living truth within, without using taxing systems or time. Beautiful story and pic! Btw, is the wise Lo Zu your own invention? I could not find him on Google. Yes, Lo Zu is my own, though it definitely is a tribute to Lao Tzu, the famous ancient philosopher and author of the Tao Te Ching. A good translation, though far from perfect (like most), is Tao Te Ching (edited by Gia-fu Feng and Jane English). It could well be in spite of the rain, interiorly speaking. And thank you. Raining a lot here too (in Illinois… from a hurricane)! My burden feels lighter already. Quite a good tale, Tom. Ah, a heavy truth, one many cannot get a grip on let alone carry. But very wise. Thank you. 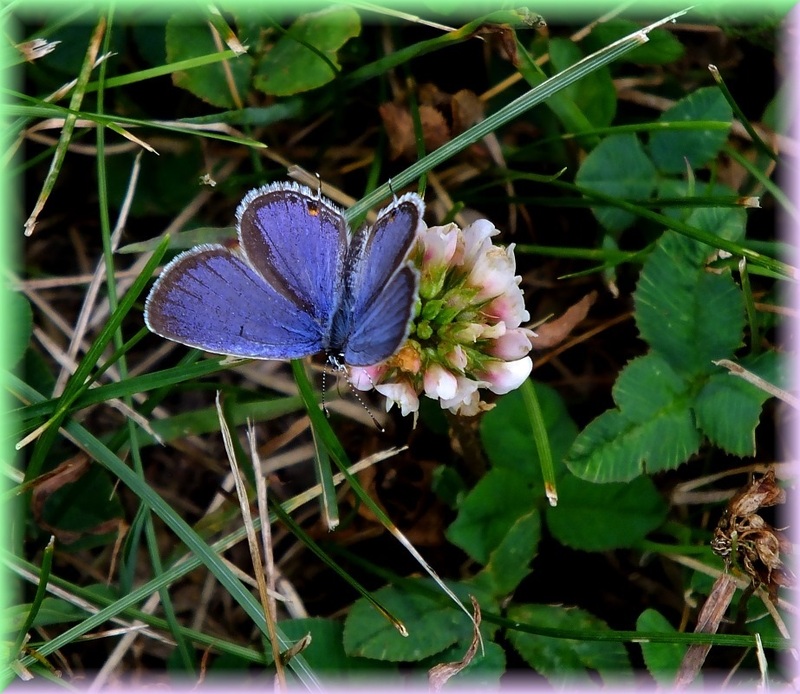 I liked your tale and I liked this beautiful periwinkle blue butterfly too. Excellent bit of wisdom you have passed along here, Lo Zu!